Most people’s introduction to Kenya McGuire Johnson likely came via an article in Ebony Magazine back in 2013. However, the article wasn’t about the music career that came to full blossom two years later with her debut album My Own Skin. Instead, Kenya, her husband and surgeon Dr. Carl Johnson, and their two sons were featured in Ebony Life’s feature “The Coolest Black Family in America. The article tells the story of how Kenya and Carl met while attending school at Howard University, their courtship and marriage and how they jointly came to a decision that Kenya should pursue her true professional passion – music. The 15 track My Own Skin is the result of that pursuit, and it is an eclectic mix of mature, jazz oriented R&B that will be easy on the ears of adult music fans. Kenya co-wrote most of tracks with collaborators that included Khari Cabral Simmons (Jiva) and Kloud 9’s Kendall Duffie. She also teamed with Kendall and his twin brother and Kelvis on the album’s first ballad, “Be Here.” The song begins with an Isleys-style guitar intro by Alton Hollis. 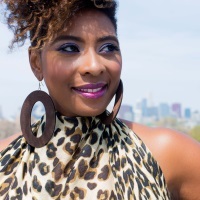 Then Kenya’s sultry alto melds nicely with the Duffie brothers’ buttery tenor on a track about how the lessons from past errors can serve to make a relationship stronger. “Mirror” is a cut infused with blazing rock guitar with soft breaks where gospel and jazz keyboards provide a contrast on a tune imploring black women to see the strength, intelligence and beauty when they look in the mirror. The mid-tempo funk/jazz number “Wednesday Girl” contains a story that puts a darker spin on the man-meets-woman-in-the-park story. A chance encounter with an attractive guy turns into a wonderful Wednesday at the park that she would love to recreate on Thursday, Friday and Saturday. However, handsome Andre only knocks on her window on Wednesday, and Kenya slowly realizes that she’s the side chick. Most of the 15 tracks on My Own Skin are originals, but the album includes a smooth version of Michael Jackson’s “I Can’t Help It.” Kenya grew up a fan of the King of Pop, but more importantly she counts song co-writer Stevie Wonder as a top musical influence. The story of the Johnsons’ decision that Kenya should pursue her musical dream serves as a lesson about marital communicate and support. And the quality of the material on this well balanced album is proof that that decision was a wise one. My Own Skin is an intelligent, self-assured album by an artist with a mission to both entertain and challenge her listeners. And Kenya McGuire Johnson is a very welcome addition to the indie soul musical world. Recommended.